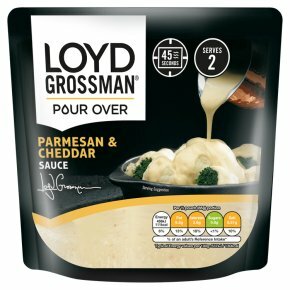 Perfect for chicken or cauliflower cheese. No artificial colours. Get Flavour... 1. To create delicious cauliflower cheese, boil 300g of cauliflower florets for 10-15 mins. and drain. 2. Heat the sauce. 3. Place cauliflower in oven proof dish, pour over sauce and sprinkle with some grated cheddar cheese and place under the grill for 5 minutes until golden brown. Serves 2 Why not try... this sauce works just as well poured over chicken. Natural separation is possible so shake well before use. Cut corner where indicated. Microwave for 45 seconds at full power (800W).Microwaves will vary so adjust heating times accordingly.Leave to stand for 15 seconds then cut open as required to pour and serve.